for the Oscars? She matter-of-factly answered, "I haven't decided yet." and touching documentary of a family who have lived their lives well and shared them with so many. First-time feature director Christopher Noice honed his entertainment skills in the wonderful world of corporatevideo, where he has been disseminating business information for more than 20 years. Producer Julie Matthews has worked successfully as an on-camera talent, vocalist, writer, casting director and producer since 1975. She has worked in the film industry since the early 1980s when she got her start casting extras in Cleveland for the 1983 film "A Christmas Story." She was a casting assistant on such films as "Light of Day," "Hoffa," and "Lorenzo's Oil." Music composition is one of several passions pursued by San Francisco-based multi-media artist Dex Craig. Dex has composed the score for two feature films, a number of on-line web series, dozens of short films, and now, a feature documentary. that have been touched, the never-ending joy of childhood in the Spring, and the resounding contentment of a life well lived. Friday April 17 or Saturday April 18 at 7:00pm. Click below to view "Eggshelland" official movie trailer. 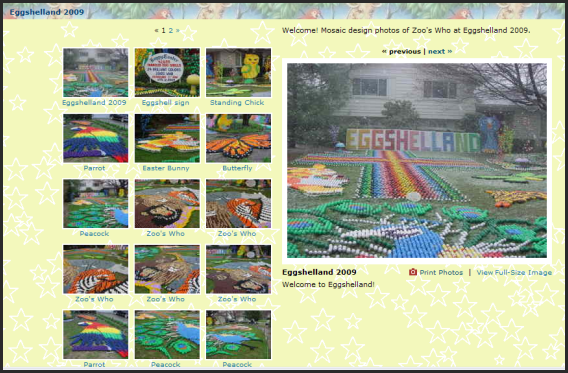 is transformed into different eggshell mosaic designs each year, always including a 50ft. Cross and our mascot, the Easter Bunny. is the only display of it's kind in the world. The idea came from Ron's Mother, who placed dyed eggshells on bushes in front of her home. a hole the size of a dime in the egg and Betty shakes out the contents. The shells are then washed and the edges of the hole trimmed. After painting, the shells are stored by color in boxes, with 250 in each box. They are used over and over again each year, and repainted, if necessary, in the proper colors. disasters. In 1998, a hail storm destroyed 10,238 shells. 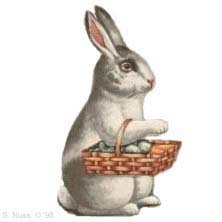 In 2002, an ice storm on 6 inches of snow broke 11,941, in 2005, 6 inches of snow smashed 5,633 shells, and in 2007 16 inches of snow on Easter morning broke 14,176. In 2008, for the first time, we were not able to put pegs in the lawn, because the ground was frozen. Our Display consisted of 6,223 eggshells, using the five figures we have on Styrofoam, usually standing in the background. We always receive excellent local coverage, and in 2000, we appeared on the Montel Williams Show, and were also featured on Extreme Cuisine, and the Agri-Country Network. We have been featured on "Ripley's Believe it or Not," and a photo was sent out by Associated Press that reached as far as the front page of an English language newspaper in Japan. We were on the "Today Show" Easter morning 2006, and CNN in 2007. 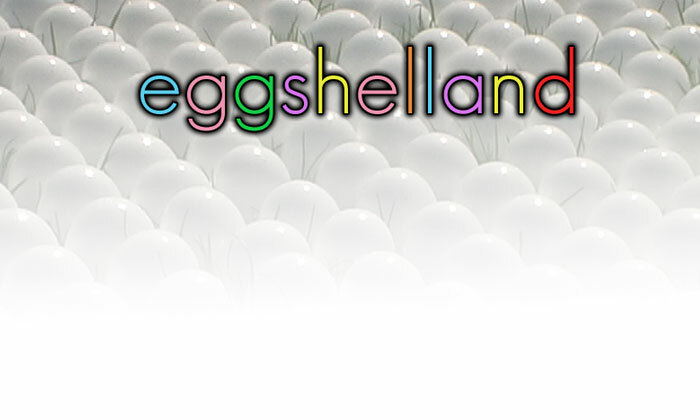 A documentary on Eggshelland, which has taken 4 years to complete, will have it's World Premiere at the Cedar-Lee Theater, in Cleveland Heights, on April 17&18, 2009. The display is lit at night, and will be up from April 5th thru April 20th. Directions: From intersection of Richmond Road and Ridgebury - make three left turns on Roland, Ashwood and Linden Lane. Webcam at Cleveland Metroparks Zoo. zoo buildings in North America, constructed in 1884. Its all happening at the zoo. I do believe its true. Cleveland Metroparks Zoo & The RainForest are open all year except January 1 and December 25. Cleveland Metroparks Zoo improves the future for wildlife by exhibiting animals and plants and providing education and conservation programs which encourage respect and stewardship of the natural world and a better understanding of our place within it. The Cleveland Zoological Society partners with the Zoo to improve the future for wildlife. Enjoy the benefits of membership, Adopt-an-Animal, or explore the advantages of corporate partnerships. Lincoln Park Zoo - 2200 North Cannon Dr., Chicago, at Lake Shore Drive and Fullerton Parkway; FAST FACT: Marlin Perkins served as director of the Lincoln Park Zoo from 1944 to 1961. 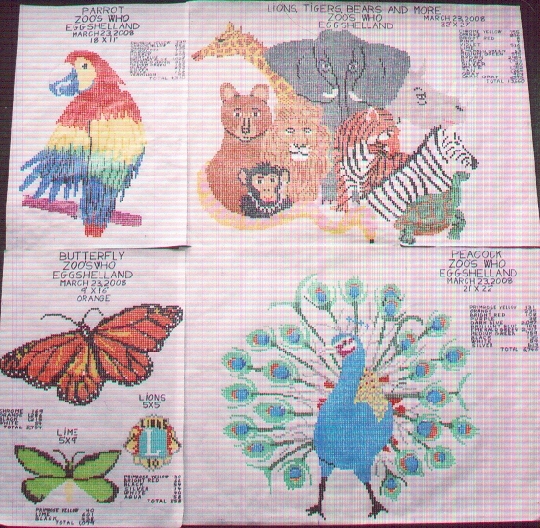 Perkins put television and natural sciences together, first with his series "Zoo Parade" -- filmed live at Lincoln Park each week -- and later with "Wild Kingdom." FAST FACT: One of Zoo Atlanta's popular residents is 15-year-old African elephant Starlet O'Hara -- who is known for her painting abilities. 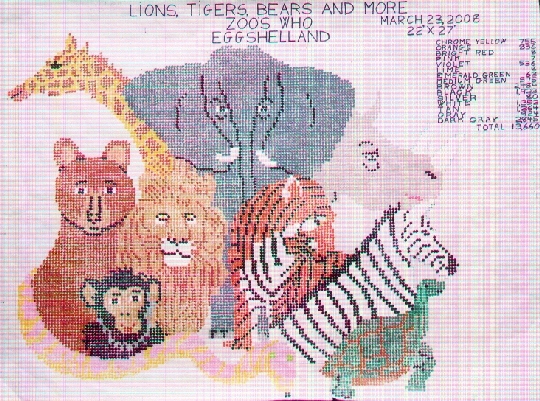 She prefers watercolors, and her works are for sale at the zoo's gift shop. FAST FACT: Admission to the Philly Zoo, which opened on July 1, 1874, was a quarter for adults and a dime for children -- for the zoo's first 50 years. San Diego Zoo - 2920 Zoo Dr., San Diego; Wild Animal Park: 15500 San Pasqual Valley Rd., Escondido; FAST FACT: The San Diego Zoo's first keeper was a one-armed man named Army, hired by zoo founder Dr. Harry Wegeforth. Army's one arm, it was said, "was all he needed." 3001 Connecticut Ave., Washington; FAST FACT: The National Zoo's first animals were a pair of elephants named Dunk and Gold Dust, obtained in 1891 -- two years after President Grover Cleveland signed the bill establishing the zoo. Columbus Zoo - 9990 Riverside Dr., Powell, Ohio; FAST FACT: "Jungle Jack" Hanna -- host of TV's "Jack Hanna's Animal Adventures" and author of several animal books -- turned the Columbus Zoo into a world-class operation during his tenure as director beginning in the late 1970s. Hanna is now "director emeritus" of the zoo. Audubon Zoological Garden 6500 Magazine St., New Orleans; FAST FACT: Zoo features rare white alligators, found in a Louisiana swamp. The 'gators are not albinos -- they are actually white -- and have blue eyes. The Parrot - composed of 4310 eggshells.